A group of volunteers from Hessle who work tirelessly to raise funds to support people with epilepsy have presented thousands of pounds worth of equipment to the Trust. Members of Hessle Epilepsy Society have presented staff on Hull Royal Infirmary’s Intensive Care Unit (ICU) with two new Hamilton ventilators, used to help people who are too poorly to breathe for themselves, and a state of the art ‘Mindray Sonosite’ ultrasound scanner which can help doctors to pinpoint and then resolve potentially life threatening problems. This is the latest in a string of donations made to the intensive care units at HRI and Castle Hill Hospital which collectively amount to more than £100,000. 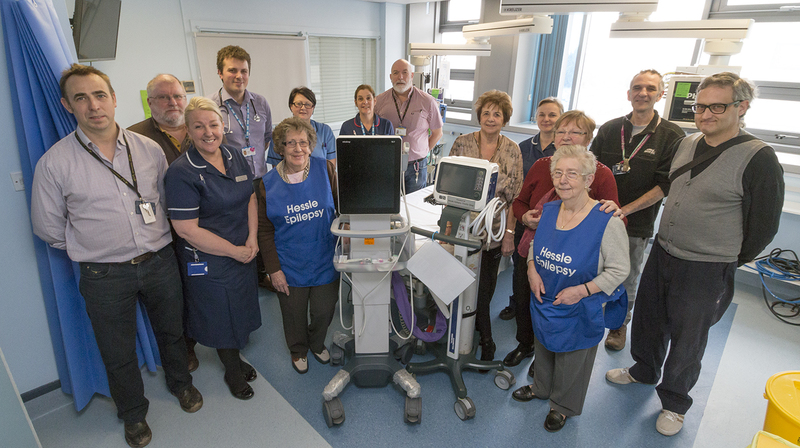 The charity’s fundraising efforts, coupled with proceeds of sales from their charity shop on Tower Hill, have seen five beds, eight clocks, two bladder scanners and 22 bedside trolleys purchased in addition to today’s ventilators and ultrasound scanner. The ventilators are better for the patient, as the respiratory support they receive is via face mask, rather than an invasive tube into the trachea which requires patients to be sedated. Instead, patients are awake and breathing for themselves with some extra support. This kind of therapy is more comfortable for the patient and, in some cases, can help patients to leave ICU sooner. The ultrasound scanner will now enable doctors to see inside parts of the body such as the neck, chest or abdomen to identify serious or potentially life threatening issues, such as restricted blood vessels or excess fluid, and then take action to address them. “Nobody expects to be in intensive care, so it’s wonderful that the volunteers from Hessle Epilepsy Society think of us and are able to support the people who find themselves here. “The equipment and the support we receive from the Hessle Epilepsy Society really helps to make sure patients can be cared for using the most up to date equipment. It also helps to make them more comfortable at a really crucial time in their lives, and this in itself offers reassurance for worried relatives and friends too.